These Russian-made rounds not only offer a great value for AK pattern rifles, but the Ruger Mini-30, SKS, and any other platform chambered in 7.62x39mm. 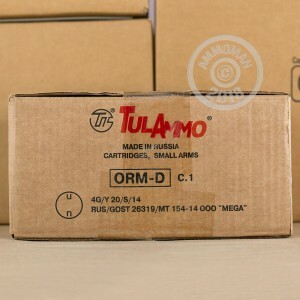 Tula Cartridge Works is the largest ammunition plant in Russia and the TulAmmo name represents their refined product line for global export. Building on 125+ years of experience, Tula uses their efficient production methods to pass savings on to you without sacrificing reliability. Steel casings with Berdan primers, while not typically reloadable, reduce costs while maintaining non-corrosive components. The casings are coated with polymer in order to lessen parts wear and keep your favorite rifle running even longer. The bullets have a Full Metal Jacket, which may be either copper or bi-metal*, and weigh in at 122 grains. This is one of the most common weights for this caliber and offers medium recoil as well as similar flight characteristics to most 7.62x39mm hunting rounds. The rounds exit the muzzle at 2,396 feet per second. will buy more. completely satisfied. every round fired, ejected properly in my new Century Arms (Made in USA) AK 47. 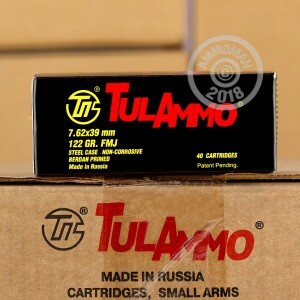 AK47 & TUL Ammo: great pair. A truly enjoyable shooting experience. Dead on accurate.